COPD is an inflammatory lung disease that causes a progressive obstruction of airflow. Long-term exposure to irritants leads to COPD, mainly cigarette smoke, polluted air, toxic fumes, and dust. Although smokers are at high risk, this condition can affect non-smokers too. Cough with mucus (smoker's cough). Working in environments exposed to dust, fumes, and pollution. A rare genetic condition is known as alpha-1 antitrypsin deficiency. My mother's oxygen level is 70 % even after treatment. What to do? I have severe pain in my xiphoid process. Please help. Is bronchoscopy and tube necessary in a pneumonia patient with COPD? Emphysema: In this condition, there is a destruction of the air sacs of the lungs and hence airway collapse. Chronic bronchitis: In this condition, there is inflammation of bronchial tubes. They form more mucus as a result of the irritation. There is a need for frequent throat clearing. - If you are a smoker, this could be a direct cause of COPD. Quitting smoking and taking an antioxidant-rich diet will help prevent worsening and exacerbation of symptoms. - If there is exposure to fumes at your place of work, be sure to wear a special mask to protect yourself. - If you suffer from asthma, or frequent respiratory infections, flu, etc., it is advisable to stay away from cigarette smoke, be it first or second hand. Treatment involves a combination of lifestyle changes and medicines. Eating small frequent meals so you do not strain yourself too much. Carrying out only those physical activities and exercises that are approved by your physician. 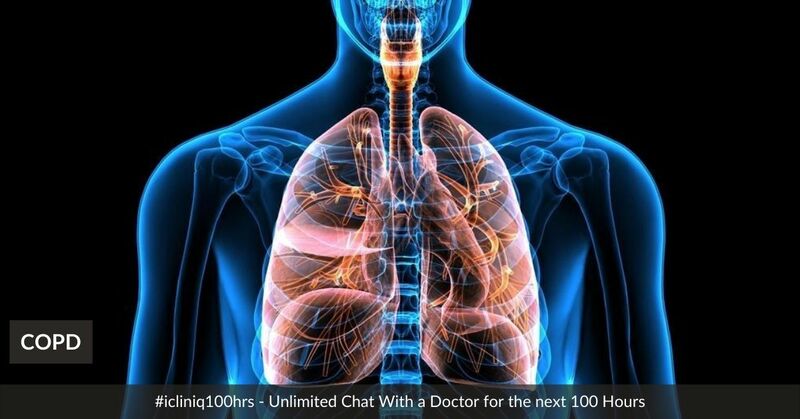 Do you have a question on Inflammation Of Membrane Covering Lungs or Chronic Obstructive Pulmonary Disease? Do my X-rays show the beginnings of asthma or COPD? I get red eyes, headache, and chest pain because of cigarette smoke. Please advice.